Picture yourself lying down relaxing. You have your feet up and your sipping on a nice hot cup of tea…. 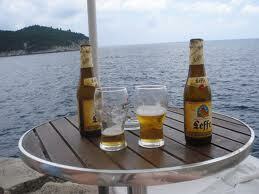 If it were me…I most likely would be drinking and ice cold beer. Either way… you have music playing in the background and then something lands in your hair. You itch and you scratch. You settle back into the relaxing position and there it is again. Once again you itch and you scratch. Very annoying. Creepy actually. SOMETHING is crawling in your hair and your not able to get rid of it! Has this ever happened to you? If so you know what a terrible feeling this is. Cat, dogs, birds, all animals are no different. They are able to feel that same sensation when they have fleas or even ticks… MISERABLE! 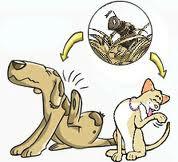 When a dog or cat has fleas they usually have more than one. Fleas are able to multiply like crazy. So if you don’t do something to get fleas under control your dog or cat just becomes the walking host to more and more fleas. 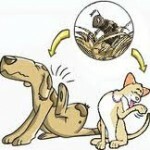 Fleas are able to JUMP to other animals as well as to you and other members of your family. Carpets are a nice breeding ground when the flea happens to fall of the host. You can of course use chemicals to rid your animal of these nasty little crawly things. There are all kinds. Chemicals come in drop form. You can buy the small vials that contain the chemical that you break open and put the liquid chemical between the shoulder blades of your animal. One of the reasons that you place it in this spot is so that they are not able to lick it… because it is a CHEMICAL. You’re also able to choose from a wide range of sprays and powders, of course all of these also contain a chemical that kills the fleas. OR… You could also use an “all natural powder type substance that is good for everyone and everything” to kill those nasty fleas. This all natural powder is used for many things including killing fleas naturally! Food Grade Diatomaceous Earth (DE) is a powder type substance that when fleas come in contact with it they will DIE within a few hours. DE scratches the bodies of insects and they dehydrate. Insects are able to build up an immunity to chemicals that are used to kill them. You never have to worry about insects building up an immunity to DE. The method that they are killed is always the same… the bodies are scratched so they dehydrate. It is important to note that the fleas MUST come in contact with the diatomaceous earth. So you will want to rub it into the fur so it gets down to the skin of the animal. Brushes and combs are good for this. Farmers and ranchers put DE in the places that their chickens and horses give themselves dust baths. This is a great way for them to be able to rid themselves of those nasty insects by doing what comes natural to them… A dust bath. I sprinkled DE on a fuzzy rug then I sprinkled catnip on the rug.. my cats took turns rolling in the catnip and dusting themselves with the DE all at the same time. They loved it! Use your imagination, I am certain you will be able to think of ways to get your dogs and cats to help you help them. I love this wonderful all natural product. I use it for many things besides keeping fleas and ticks off my animals. I eat it for my good health TOO. Please LIKE US on Facebook to keep up with our posts about one of Mother Natures Miracles.